Organic. Wheat & gluten free. Vegetarian Society approved. Suitable for vegans and coeliacs. 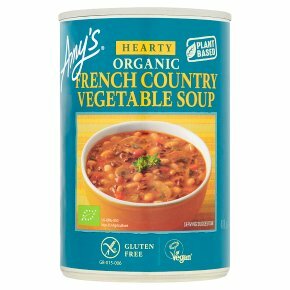 Kosher - Pareve.In Amy's Hearty French Country style Vegetable soup, organic long grain red rice is slowly simmered with organic vegetables and herbs to create an unusually flavoured yet satisfyingly robust meal in the French country tradition. Ready to serve. Do not add water.Ovens vary, so please use these instructions as a guide only. (800 W): Empty contents into microwavable container. Cover and heat on full power for 2 minutes stir and heat another 1-2 minutesuntil piping hot.